Deaf sensitivity is the practice of learning and becoming aware of the needs of a person who is d/Deaf or hard of hearing (DHH). Deaf sensitivity is not simply a discussion that is centered around using technological and linguistic means to adapt to the needs of a person who is DHH, but to become a better communicator and provider of services at work to people who are DHH. It’s the adaptations of body language and the approach of an interaction that can drastically change the outcome of a social encounter, business relationship and first responders’ actions. In too many instances where Deaf sensitivity training has not been given to first responders or law enforcement, loss of life has happened. Being sensitive to the needs of a person who is DHH shows adaptability and the traits of a good communicator…a good person, in fact. Adaptability and being sensitive to environmental circumstances are crucial components of any good communicator. Recognizing these circumstances and adapting accordingly is what will draw the line between a positive interaction or a negative one. Deaf sensitivity training is about adapting to a person who is Deaf or Hard of Hearing. Know the needs, the body language, the basics that may not seem obvious, but are very much so as you will see. This is the reason we named the class I Never Gave THAT A Thought! So many have said that or a similar phrase in class. Call us at 480-615-8900 with any questions you may have. 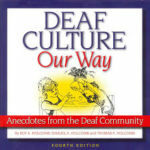 Deaf Culture Our Way: Order Now!